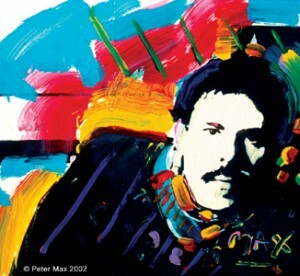 Peter Max is one of the most important contemporary artists of our time. He evolved from a visionary commercial pop artist of the 1960’s to a master of Neo-Expressionism. His use of vibrant color and bold line impart an optimism that has led to his continued popularity as he transitioned from a commercial pop artist in the 1960s to the master of Neo-Expressionism he is today. From his early endeavors to his more recent works, Max’s artwork has become a part of contemporary American culture. Park West Gallery is the largest and longest-running dealer of Peter Max artwork in the world. Since 1970, Park West Gallery has sold thousands of unique Max works, most exclusive to Park West Gallery. The Park West Max Collection includes a wide variety of some of Peter’s most popular iconic imagery, including Liberty Head, Statue of Liberty Flag with Heart, Better World, Umbrella Man, Angel with Heart and Mondrian Ladies, among others.